GOP lawmakers took their first step in that direction Wednesday by voting to repeal President Obama's health-care overhaul law. Major health-care firms and their employees gave Republican leaders at least $5 million over the past two years, including well over $2 million to Boehner and Majority Leader Eric Cantor (Va.), according to a Washington Post analysis of contribution data. Major corporations and other interest groups often favor whichever party is in charge, as they did in 2006 when Democrats took control of Congress. But the surge in donations to Republicans underscores the extent of the business community's unhappiness with Democrats and Obama, who could face serious difficulties raising corporate donations for his 2012 reelection bid. The president has made efforts in recent months to improve relations with the business community, including hiring William M. Daley, a former commerce secretary and J.P. Morgan Chase executive, as his chief of staff. Cantor received at least $5.6 million from corporate-linked donors during the 2010 midterm campaign, including $2.4 million from companies and employees in the finance, insurance and real estate industries, according to the Post analysis of data from the Center for Responsive Politics. The total marks a 40 percent increase from 2008 and puts Cantor well ahead of most of his House GOP colleagues. At his first news briefing this month, Cantor signaled that business issues will be a priority for the GOP majority, including attempts to reverse key Obama initiatives. "We are going to be placing our marker down and insisting that our committees go about identifying and overseeing what the administration's regulatory agencies have been doing, in terms of their job-killing agenda," he said. Banking, insurance and investment firms gave millions more to lawmakers heading finance-related committees, including Ways and Means Chairman Dave Camp (Mich.), Budget Chairman Paul Ryan (Wis.) and Appropriations Chairman Harold Rogers (Ky.). Financial Services Chairman Spencer Bachus (Ala.) - who will oversee attempts to undo Obama's Wall Street regulatory changes - received more than $1.2 million from the banking sector, accounting for the vast majority of his total contributions in 2010, records show. The pattern is similar for other key House panels. 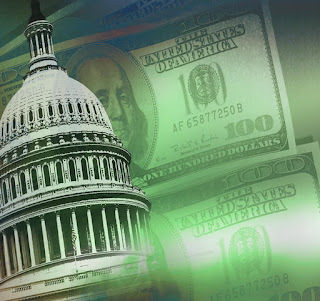 Rep. Fred Upton (Mich.), chairman of the Energy and Commerce Committee, received more than $400,000 from the energy and mining industries, a leap of nearly 50 percent from 2008. Major contributors included employees of DTE Energy, CMS Energy and the Edison Electric Institute, which represents utilities, records show. Upton, whose office did not respond to a request for comment, has vowed to roll back new greenhouse gas regulations that oil, natural gas and coal firms oppose. The farming and agribusiness lobby gave Rep. Frank D. Lucas (Okla.), chairman of the Agriculture Committee, more than $600,000 in donations, according to the analysis. Rep. Howard P. "Buck" McKeon (Calif.), who chairs the Armed Services Committee, received nearly half his contributions from the defense sector, which is gearing up to oppose budget cuts proposed by Defense Secretary Robert M. Gates. Ryan, who has emerged as the House Republicans' leading voice on budgetary issues, took in more than $1.4 million from banks, hedge funds, investment houses and other financial-services companies. Spokesman Conor Sweeney said Ryan "remains committed to the principles and reforms he's advocated since he first ran for office" in 1998. "Chairman Ryan continues to seek input from many sources - those he serves in Wisconsin's First Congressional District, his colleagues in Congress, economists and more - on how to best tackle our nation's most pressing fiscal and economic challenges, " Sweeney wrote in an e-mail statement. Representatives for other lawmakers featured in the Post analysis did not respond to requests for comment. Scott E. Talbott, chief lobbyist at the Financial Services Roundtable, said the increase in giving to Republicans by major industry groups partly reflects hope that the GOP can curb Wall Street regulations and other restrictions being pushed by the Obama administration. The roundtable, which gave about 60 percent of its donations to Democrats in 2008, shifted its giving to favor Republicans in 2010, records show. "We contribute to those members of either party who thoughtfully and carefully consider the positions on issues of importance to our industry," Talbott said. Tom Donohue, president of one of Washington's most powerful lobbying groups, the U.S. Chamber of Commerce, said in a speech this month that the group would join Republicans in pushing for repeal of health-care legislation, environmental restrictions and other new Obama administration policies. But Donohue also criticized House Republicans for considering potential budget cuts to the Highway Trust Fund. Democrats and liberal groups have seized on the surge in GOP corporate contributions in an attempt to portray Republicans as beholden to big business. Christy Setzer of U.S. Chamber Watch, a union-backed group that criticizes the U.S. Chamber of Commerce and other business groups, said the corporate contributions are aimed at ensuring that GOP lawmakers "pass their pet agendas." The Public Campaign Action Fund, which favors public financing for campaigns, calculates that candidates supported by conservative tea party groups received more than $11 million in contributions from the finance, insurance and real estate sectors. David Donnelly, the organization's national campaigns director, said such donations run counter to the populist sentiments of many tea party voters. "They have to decide whether they are representing their constituents or the Wall Street donors who expect a return on their investment," he said of House lawmakers. One of the most outspoken critics of Obama's regulatory policies, Rep. Darrell E. Issa (R-Calif.), sent more than 150 letters to companies and trade groups in December asking which federal regulations should be scaled back in order to create jobs. Records show that Issa, who serves as chairman of the Government Reform and Oversight Committee, received more than $750,000 in donations from the finance, health-care, insurance and energy industries, among others. Issa spokesman Kurt Bardella said Democrats also solicit contributions and advice from corporate donors and noted Obama's high-profile efforts to reach out to business leaders. "The idea that talking to job creators about job creation has some sort of sinister motivation is ridiculous, especially when the president is doing the same thing," Bardella said. "We're more than happy to hear from all sides."